To control remotely through the Internet electronic devices such as LEDs, light and temperature sensors, add more microcontrollers with applications. Log readings and produce dynamic graphs. A Maxim DS18B20 added to the AXE050 board reads temperatures. 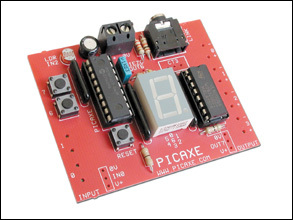 The advantage of using Picaxe18M is that the same ports are used for control and programming. Reading and control of AXE050 board is done using RS232 protocol. The onboard connections are used for RS232 control. if b0 = "n" then                 'looks for "on"
else if b0 = "t" then            'looks for "t"
sertxd (#bit10 ,32, #b2, 32, #b3, 13) 'Sends status. light and temp to server. 'Bit 10 is the on/off status of Out 2. '0 = ASCII 48, 1 = ASCII 49. 'eg, the least significant 8 bits (byte) of a 10-bit word. 'This byte represents a voltage of 0 to approximately 1.25. 'It's not necessary to read the most significant bits. A Windows-based XAMPP server is installed in a PC. The server is hooked to a local network with a fixed local IP. The application is situated in a network that has no fixed public IP, hence DynDNS services is used. The router routes all external demands to the fixed local IP. Note COM2 is used at baudrate of 4800 setup in Control Pannel of Windows XP. All batch files are then converted into .exe using Bat_to_Exe_Converter. Finally the php codes. #the following draws the graticle lines: gray, dark gray. #the following draws the data plot onto the "graph paper"
A special thanks to Max Carter for sharing the PICAXE and graphic display codes. The project was on online but has been removed for difficulties in maintaining it. 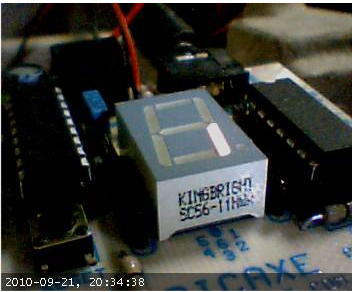 This entry was posted in Internet of Things and tagged AXE050, DS1820, DS18B20, Internet of Things, Kermit, Max Carter, PHP, Picaxe, Picaxe-18M, XAMPP, YAWCAM. Bookmark the permalink.